From jeliya to cha cha cha, Shandong to sean nos, and the Beatles and beleganjur to Bollywood and belly dance, the second edition of World Music: Traditions and Transformationstakes students on an exciting global journey of musical and cultural discovery, exploration, and experience. Through clearly focused case studies of diverse musicultural traditions, Michael Bakan illustrates the transformative life of world musics from traditional folk, ritual, and classical genres to contemporary popular and art musics, jazz, and world beat. Integral connections between particular musics and their historical, cultural, and international contexts are consistently emphasized. The text also includes a globally inclusive introduction to core elements of music and culture that makes its unique and friendly approach accessible to music majors and non-majors alike. Chapter 1: What, in the World, Is Music? This book literally rocks. I love how it effortlessly transitions to one period or the other. Awesome time reading it. 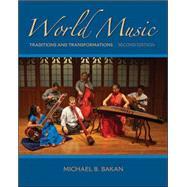 World Music: Traditions and Transformations: 5 out of 5 stars based on 1 user reviews.